Señora Castro borrowed 2,000 pesos (about US$165) a month ago to start a new “fast food” business. 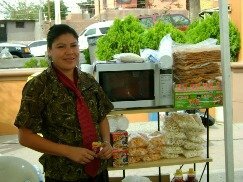 Her loan came from a ProMex Group supported charitable micro-finance organization in Sonora, Mexico. She used to rent a microwave oven but with her loan, purchased one. She sells her food close to her home at a little stand. She marks up what she sells about 40%. The money she earns helps to support her family. She has three kids.